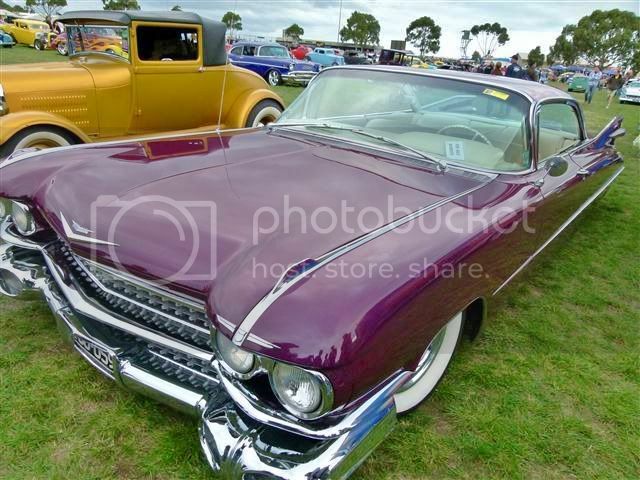 Tomorrow, depending on the weather, going to Geelong for the 20th Australian Street Rod Nationals I am excited about the photo opportunity to post here. Hope the weather stays stable. It will be a good 2-2 1/2 drive for us to get there. Hate going through or near the city though, so will leave a bit early before all the shoppers are up and about. Anyway, I am happy to report I had done a marathon walk of 6 hours, and took photos at the rate of 100 per hour!! Once I recover, I will put some pics in here I have already stuck 6 or so more pics of 'yellow' cars in Curly's photo comp for this month. Amazing how some of the registrations have the sounding word of yellow in it somehow...very clever indeed. Taking photos of custom cars in a public display area with people all around is oh-so-challenging, but I think I did well, and many others were aware of people taking photos and would stop in their tracks to let the photos be taken, there are so many thoughtful people, it was pleasing to see. In the pavillions, where many businesses set up with their goods for sale, like custom parts etc. there was one man in his stall that had lots of DVD's of custom cars, and heaps of computers playing different DVD's....it was so well done, and then he had a DVD of over 400 photos he had taken of the cars for $10. If you didn't bring a camera, or your battery went flat, or you were not pleased with your own photos, this was a good buy. Here is a pic of one of my fave 3 cars, for now. The colour was sensantional! That's a nice flake in the paint and you certainly have more stamina than me.. 6 hrs? .... I wouldn’t have lasted an hour! !